Bristol City Council (BCC) was named winner of the Best Smart City Project award at this year’s Smarter Travel Awards, receiving the award for the deployment of its Traffic Control Service that was integrated into the council’s new Bristol Operations Center in 2017. The award was announced as part of the Smarter Travel LIVE! 2018 integrated mobility conference and exhibition. Held annually, the Smarter Travel Awards aim to recognize and showcase the smart projects, people and technologies that are defining future mobility, celebrating their success and impact. The Best Smart City Project award is given to the scheme that has best shown a holistic approach to becoming smarter, cleaner, safer and more sustainable. The winner must reflect all the elements that contribute to becoming a ‘smart city’, such as: data, air quality, connectivity, physical and digital infrastructure, intelligent mobility and other applications. The new Bristol Operations Center was the realization of the council’s long-held ambition to bring together the city’s three Control Centers into one purpose-built, state-of-the-art facility, which is now home to the Traffic Control Center, Emergency Control Center and Community Safety (CCTV) Control Rooms. 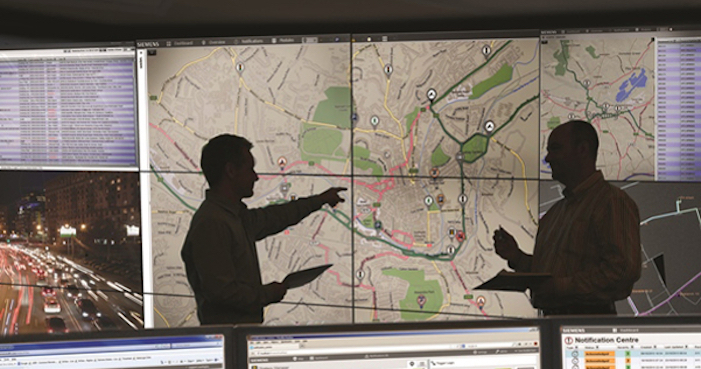 From the Operations Center, Bristol’s Traffic Control team manage the city’s road network using a range of intelligent infrastructure tools, with the latest evolution of Stratos, Siemens Mobility’s proven integrated highways management platform, at its heart. The new traffic management system is cloud-hosted, ensuring that it is not only robust, secure and resilient, but also routinely backed-up and future-proof. It features an urban traffic control (UTC) system running the widely used SCOOT (Split, Cycle, Offset Optimization Technique) real-time traffic control and monitoring software system. The adaptive platform is connected to the network’s traffic signals at junctions and crossings. It collects data from on-street detectors to optimize the flow of vehicles at controlled junctions, and helps reduce the overall delay to drivers. Effectively SCOOT maximizes the available network capacity across the city network.